This home has Free Upgrads, the 1st fl has a queen suite with a full bath, on the 2nd fl. there is the king suite with a full bath. The 2 bedrooms have 2 twin beds in each with new pillow top beds and TVs in all bedrooms. The kitchen is fully stocked, free secured wireless internet, new front loader washing machine & dryer, blow dryers in all bathrooms, portable crib, hi chair, stroller, and DVD/CD, all linens and towels are provided. Only a short walk to the Regal Palms Clubhouse/water park. This resort is a gated community and has 24 hour guest reception, casual dining, business center, game room, sundry store, swimming pavilion with 2 heated pools, lazy river, water slide,full spa, tiki bar, sports lounge has pool tables, darts, huge TVs and entertainment, full gym, computer room, and golf (Highland Reserve). Only 8 miles to Disney World. The property is ideal for disabled and elderly guest. There is parking for two cars at the from of the property. The whole resort is an excellent choice for families. Just opened Banana Jacks with skee ball, pinball, pizza, parties for the entire family. There is everything you need for a great relaxing day at this resort. Hang out at the outside tiki bar and enjoy the entertainment, beach volley ball court, hot tub(in/outside), pool table and watch a movie at the pool side. The Pool area is opened until 11:00 pm. There are all types of activities for the children. 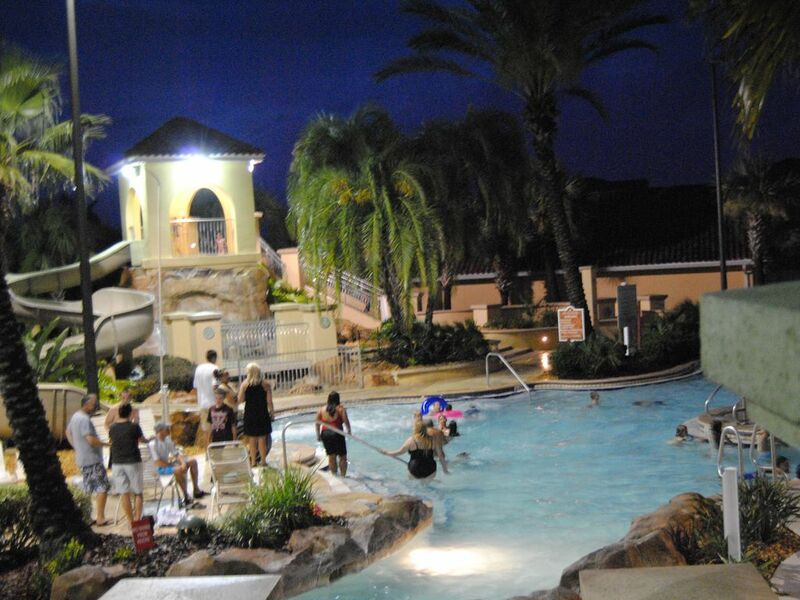 You do not have to go to the parks everyday, enjoy your day and evening at the Regal Palms. There is a hi chair, portable crib and stroller for use at no additional charge. The home is strictly NON SMOKING. Due to the Home Owners Association requirements, pets are allowed. There is a hair dryer in all bathrooms. A shuttle service is available at a reasonable rate. Only adults 21 years of age may reserve this home. There is a deposit of $200 required to block the requested dates, and the total balance paid 14 days before the check in date. There is a $12.95 per day, per home resort fee that is paid directly to the Regal Palms Resort upon check in. I have upgraded my home to make your vacation easier and enjoyable! This home has it all which is located in the 4 star Regal Palms Resort & Spa and only 8 miles to Disney and close to all Orlando attractions. There is a Publix Supermarket, strip mall with pizza, ice cream, liquor, chineese food, medical center. Laura's Villas at the Regal Palms is the place to go! I recently spent a week at this resort and had a great time. It is close to Disney and there is shopping and restaurants close by. We decided to book the home through Laura of Laura's Villas. The process was simple and Laura was fantastic to work with. She even let us check out later since our flight was delayed at no additional cost. The home was clean and roomy, enough for my immediate family and my in-laws. It was very close to the club house which has water slides, a lazy river, a restaurant, and a spa. All of the homes in this resort are individually owned and not maintained in the same manner. We were happy with this home and will be coming back in the near future! Thank you for your great review of my home. It is very important to me that you enjoy your vacation without any problems. Looking forward to your return to my home, I do offer special discounts when you decide to stay in my home in the future. There is an additional charge of $12.95 US per night per reservation, $5.00 for monthly stays, (NOT PER GUEST) that is paid directly to the resort upon check in for temporary membership of the Regal Palms Club. Benefits entitles free access to all the facilities at the Regal Palms Resort which includes full use of the Water Park, two heated Swimming Pools, water slide, lazy river, heated Jacuzzi’s, full gym, sauna, free WiFi, Entertainment, and pool towels. All guest will be permitted free use of Banana Jacks jungle gym.